Early on Wednesday March 28th, a banner reading “Close the Camps, Open the Borders” was dropped from the Commonwealth Bridge in Canberra, the capital city of Australia. Flares were let off to highlight the action. The action was taken in solidarity with the ‘Superglue 7’ who are on trial in the Supreme Court this week. The Superglue 7 are members of Whistleblowers, Activists and Citizens Alliance (WACA). On November 30th, 2016 they travelled with 50 other members from across Australia to Canberra. They all went to Parliament House where they disrupted Question Time from the public gallery. They called for an end to Australia’s inhumane policies that are in breach of UN Human Rights Conventions. The Superglue 7 glued their hands to the balustrade in the public gallery. The group used a ‘mic check’ speech to demand that the government closes all refugee detention camps and that detained asylum seekers be safely resettled. As a result, the seven were charged with intent to damage Commonwealth property. Several other protests in support of refugees and in solidarity with the accused have occured in the nation’s capital over the past three days. On the second day of the trial, other activists interrupted Question Time again. They stated that they refuse to be complicit in the government’s human rights crimes against refugees. No superglue was used and all of the protesters were released without charge. A spokesperson for the group said “while asylum seekers and refugees are held indefinitely in appalling conditions, people will continue to fight against bipartisan policies of cruelty that are Australia’s shame. We will not stop until there is justice for refugees”. 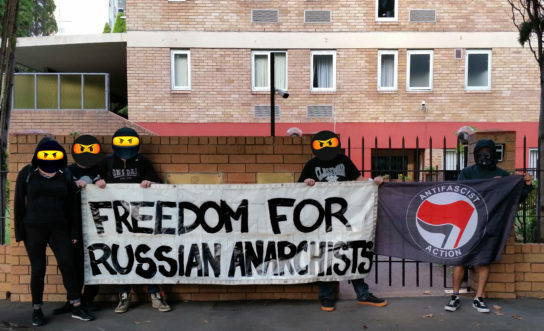 18 March – In response to a solidarity appeal from comrades in Russia, on the 18th of March, the day of the Russian elections, a group of anarchists in Sydney, gathered at the Russian consulate. 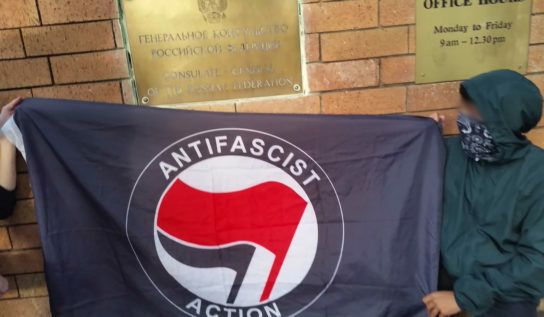 We distributed leaflets about the situation of imprisoned Russian anarchists and antifascists and chanted soligans against police, prisons and the Putin regime. March 8, 2018 – Residents of RW 11 Tamansari, Bandung, and solidarity consisting of students and communities who are still struggling to maintain their homes are clashing with contractors and mass organizations that supporting rumah deret (mass apartment project). This event occurred on Tuesday March 7, 2018 around 10:00 pm in the area around the Film Park. Citizens and solidarity who want to occupy the Backhoe to stop the development process being held by mass organizations. Because of the defeat, mass organizations began to attack people and students with beatings and throwing stones. Dozens of students and residents were seriously injured and had to be rushed to Sariningsih hospital. A backhoe is also burned by a mass of Tamansari solidarity. 7 March, 2018 – At Women’s March 2018 in Salatiga (a city in Central Java province), the Libertarian Student Federation (FML) called for the direct use of violence against all forms of sexual repression in Indonesia. This is a response to the RKUHP (planned revisions to the Indonesian Criminal Code) which is considered to be detrimental to the women’s group and other marginalized gender groups. In addition, this call is also a response to the rise of ultra-nationalist and Islamic fundamentalists who became the moral police for all sexual activities, as well as a form of autonomy and solidarity with regard to the handling of cases of sexual violence outside the intervention of law and police. In 1978 queers took to the streets of Darlinghurst to denounce the intersectional oppressions we have faced for centuries. Queers with legitimate political critiques of the homophobic, patriarchal, capitalist status quo used a diversity of protest strategies to defiantly celebrate our identities and genders. Some danced, some kissed, and some carried placards, but most significantly, militant queers, fed up with being criminalized (and subject to various forms of physical, sexual, verbal abuse), literally fought the enemy, the notoriously violent, homophobic Darlinghurst cops, for our right to exist. Now, 40 years later, queers continue the struggle against ongoing and diverse examples of state sanctioned anti-queer violence, and the capitalist pink-washing of what Mardi Gras represents as a significant moment in queer revolutionary resistance. Remember, ‘they’ only gave us ‘rights’ because we rioted! 40 years ago, staunch queers deliberately took to the streets to assert our rage as causalities of socially sanctioned violence by the mainstream establishment: police, religious bodies, authoritarian state-run institutions (prisons, psych wards etc) and homophobic “upright citizens”.